That's a hay loader. Interestingly, they followed the wagon they were filling -- I can't think of anything else that normally does that. Usually the thing doing the filling is in front of or to the side of what is being filled. 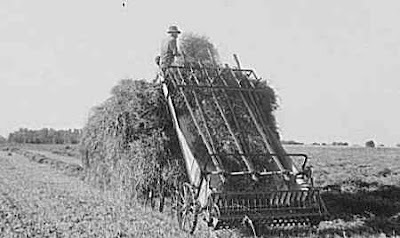 Driven by the wheels and a chain, hay would be picked up from windrow and then moved up the loader by the wooden bars with steel fingers. The rest of these photos were taken in Ohio during 1938 by Ben Shahn for the Farm Security Administration. 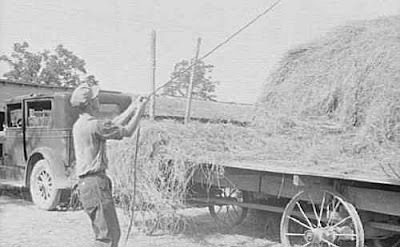 Hayloader in action -- it was quite a work out for the pitchfork men on top of the load during the hot, sunny days best for making hay. If you drive around you'll see barns built as late as the 1950s still setup for loose hay work -- the dead giveaway is an extension of the roof over a beam from which a pulley used to (or still does) hang. This is an outside haystack being made. 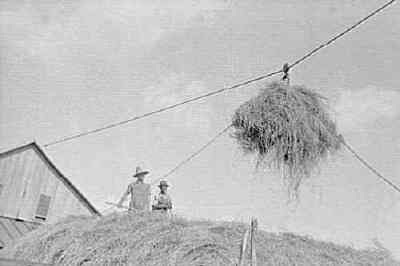 Properly made a haystack resists rain quite well -- same principle as using straw to thatch roofs. Inside a barn you would see a similiar operation, though. 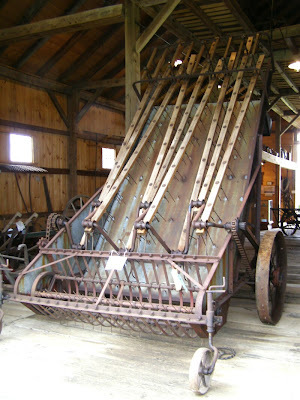 A device would grab hay, be hoisted up the pulley either by a team of draft animals or a motor vehicle, and then slide down a track in the barn to where the farmer wanted to dump it. Since the track was in the center, the hay would still need to be pitched to the sides. Today dry hay is normally baled. Even in Amish country, where horses will draw forecarts with a motor on them to drive the balers. It's less labor intensive for man and beast, and the hay is packed denser so more will fit under the barn roof. Most large farm operations make large bales -- typically around 1200 to 1800# depending on size and how densely packed the hay is. These are much more efficient to handle with machines, and labor to handle small square bales is scarce. Small squares remain popular for small farmers without much equipment -- they're typically around 45# when being sold to "horsey" people, or 75# when baled for "cowey" people. Remember to ask how much a bale weighs when pricing them! In my area many dairy farms do not make hay -- they "greenchop," cutting the grass into fine pieces that are ensiled. When packed tight and air limited, usually by covering with plastic held down by old tires, the grass pickles itself. This silage is retains a lot of nutrition and is very palatable to the cows -- and it uses relatively little manpower.